How truly fabulous to get updates on Hershey. We can see that he's got a wonderful human caretaker, and that makes us so happy for him. Thought we heard the last of him, but I see he is still very happy in his new home, as the only cat in charge. His personal page is still up as well I see. 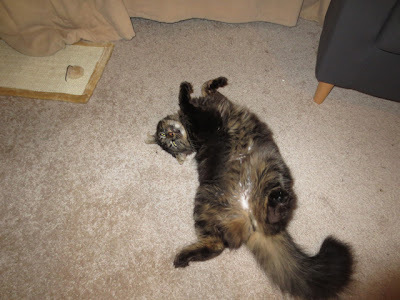 Hershey is truly a niphead and look at that floofy tummy! It is nice to know there are cats out there that like fresh nip. I couldn't get any of mine interested in it, not even my niphead..
Our Mommy is squealing with delight at the sight of the gorgeous bellah! I am SO glad you get pictures and updates! SO glad. How wonderful to get such a great update on Hershey. Sounds like he is in a great home! Love that tummy! ummm - yeah, he does look a bit stoned in that second picture. We are SO happy for him and Mike - sounds like a perfect match!! 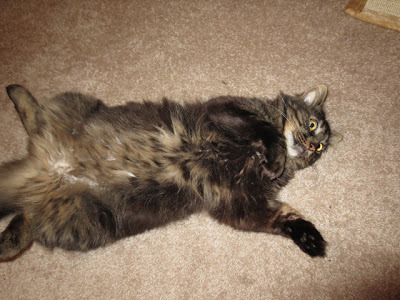 Now Hershey is one happy cat! I just love that Mike is kind enough to share updates about Hershey!! Hershey seems to be thriving with him! I couldn't be happier!!!!!!!!!!!! !